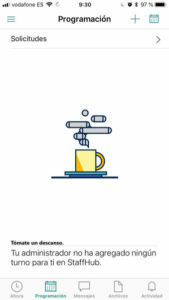 StaffHub is one of the applications included in the Office 365 suite, its main function is to manage working hours, and more precisely, work shifts. It was designed to be used mostly on mobile devices so it has a very neat interface. It is a tool designed for businesses where emlpoyees do not have a fixed schedule. Usually a team of people who have to organize their own schedule and split the shifts use an Excel sheet to establish that distribution, which is not bad but is somewhat archaic. 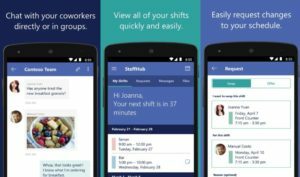 In addition, people almost always use groups in a messaging application to be able to chat with colleagues when it comes to organize the shifts or make last-minute changes. This is the main purpose of StaffHub, a product where you can organize our shifts together with your colleagues in a very simple and friendly way. Now that we know what StaffHub is, let’s have a look to the available features. We will focus on the mobile application since it is a tool designed to be used mostly on smartphones and tablets. 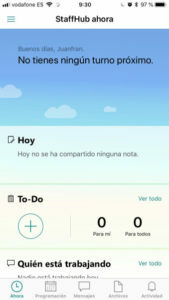 When opening the app, the main screen displays your pending tasks and the schedule for your next work shifts. StaffHub contains a calendar where you can see our schedule for the following days and from where you can propose a shift change to one of our colleagues. You can open a private chat with another workmate or participate in a group chat. You can also access files that have been shared with your group. StaffHub is very intuitive and easy to use. First you see when our next work shift begins, followed by the tasks that are pending. You can also check what colleague of yours is working at that time. On the next screen you can access the complete list of tasks and incoming shifts for the following days, the chat and the pending files. StaffHub is a very useful application for businesses where it is necessary to manage a group of people with dynamic and changing schedules. It offers a common place to manage all the problems when it comes to schedule work hours, switch shifts between colleagues and communicate with the other members of the group. What is your Office 365 secure score?